Email may be most popular channel for marketing, but brands are sending more emails than ever and as a result, messages are easy to ignore. Brands who get email marketing right, however, can engage their email subscribers. To engage subscribers, marketers must use industry knowledge and resources to improve content and revitalize email marketing. Here are three tips. Fans care about their products; however, marketers don’t always have to sell them, especially if they aren’t in the buying stage of the customer lifecycle. Marketers can use non-product focused ‘sticky content’ in their promotional emails as a way to keep subscribers engaged. This bite-sized content can include ‘word-of-the-day,’ ‘recipe-of-the-week,’ ‘destination-of-the-month’ and much more and is designed to capture an audience’s attention and keep them coming back for more. This trains subscribers to open by acting like a digital bell (or whistle!) that piques their interests. •	Find the right content: In finding the type of content that works best — humor, how-to videos, relevant fun facts — it’s imperative to consider a brand’s audience and industry to find the right combination. Once that’s done, it’s easy to plan longer-term and create a content library to facilitate the message creation process. In addition, utilizing email templates and style guides can further simplify content creation and make it more efficient and consistent. •	Tease with tidbits: Subscribers are interested in hearing from a brand, but few want to see a consistent flood of generic sales emails. Tidbits of editorial information make the sales pitch more subtle while still maintaining focus on it, not at the expense of engagement the end goal of sales. Whether it’s an email about upcoming events or a quick anecdote about industry happenings, less sales-oriented emails can develop and sustain brand awareness. Scattering these emails throughout the message stream encourages subscribers to pay attention throughout the year and nurtures customer relationships. It encourages consumers to consider a brand when they are ready to purchase, as they have been opening emails consistently. •	Pay attention to trends: When leaning on popular trends, a marketer should ensure that his or her approach drives unique content and isn’t something that consumers will get elsewhere. 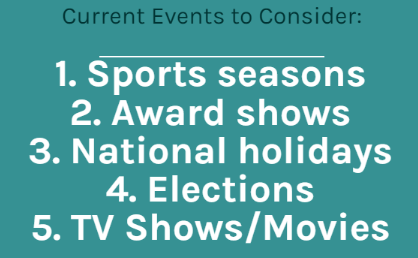 For example, when developing content around holidays or other events relevant to a brand’s audience (the Oscars, elections, football season, etc.) make sure that it inverts expectations to stand out among the crowded marketplace. •	Save time by removing excess links: As long as sticky content is dispersed throughout an email marketing strategy, a brand’s messages can stand alone without a variety of links ‘distracting’ from the content’s focus. Save those many links to a brand’s products for when consumers are ready to buy. Best of all, sticky content doesn’t have to be cumbersome. With a simple review and some testing of a content marketing strategy, any brand can implement quick strategies that keep subscribers engaged. As marketing emails saturate consumer inboxes, making users feel connected to a brand is one of the most effective ways for marketers to stand out and engage subscribers. •	Customize product content: Drive engagement by paying attention to the audience at the individual subscriber level. Offer email consumers targeted content that is tailored to the interests they’ve specified in a preference center or the purchases they’ve already made. Ensure that this messaging is consistent across channels. •	Think beyond text: The human brain can process visuals in 1/10th of a second, so content marketers need to work quickly to engage. Try gifs and videos as alternatives to more traditional content. These media are easily processed, stand out from the crowd and cover a variety of interest topics. •	Utilize user-generated content: Tell a brand success stories by adding social media data or customer reviews to the content. This technique adds a personal touch and increases engagement while leaving some of the content work to the brand’s advocates. Brands can use custom content to achieve their marketing goals without seeming intrusive. Rather than pushing a “BUY, BUY, BUY” message, brands can create a sense of connection with consumers by incorporating relevant information into their messages. Be it a birthday, an anniversary, or a loyalty achievement, celebrating a personal milestone or the consumer-brand relationship can go a long way and create true brand advocates. Testing is the most effective way to identify ‘winning’ content type that boosts engagement and leads to conversion. In looking at email activity and preference center data, brands can determine what types of content subscribers are most interested in receiving. Content preference can be further informed by purchase data to develop an email strategy that engages the consumer while highlighting a product of interest. •	A/B Testing: Marketers can A/B test a variety of message components (subject line, offer type, tone, call-to-action) to find the combination that generates the best open, click and conversion rates. The process is simple – brands develop two options for the message component they’re testing and track the success metric(s) for each option (be it opens, clicks, conversions, Web traffic, etc.). The emerging winner is typically easy to determine and, at least in my experience, surprisingly counterintuitive. Remember that results generated by the test winner should always be statistically significant. •	Preference Centers: Preference centers are a great way to determine what mailing frequency, content type, product category, communication channel, etc., work best for each subscriber. Since the consumer herself fills out each preference center field and is thus the source of the data, this is a low-hanging fruit for marketers who can use the data to develop highly relevant campaigns with the desired cadence, product highlights and call-to-actions. To ensure that campaigns are relevant and timely (and therefore engaging! ), brands need to continuously test and improve their emails. They should make an effort to maintain their preference center data as up-to-date as possible by sending subscribers regular requests to update their information (perhaps on quarterly or biannual basis, depending on the brand’s industry and target audience). In the age of consumer-managed relationships, content is the key to keeping subscribers engaged as it enables brands to stand out. The marketing landscape is changing and the role content plays will only continue to grow. Marketers must make sure their brands have the right tools to harness its power. Ivy Shtereva is senior marketing manager at Yesmail, where she is responsible for multichannel strategy and implementation across the email, database, Web and direct marketing channels.